Don’t hesitate to go cherry blossom viewing, even on a cloudy day, because if there’s one thing I’ve learned is that cherry blossoms won’t wait. When it’s time for the petals to fall, you want to be there. Rain or shine, it will still be spectacular. 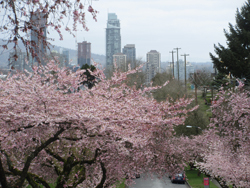 There are two rows of akebono cherry trees at 5th avenue and Lillooet. A bonus feature is that you get the highrises of Burnaby’s Brentwood area in the background. This location is very close to 6th and Slocan where you’ll find akebono forming an archway over the street, so you should visit both. Visit the Festival Neighbourhood maps to see what’s blooming in your area.